SleuthQL is a python3 script to identify parameters and values that contain SQL-like syntax. Once identified, SleuthQL will then insert SQLMap identifiers (*) into each parameter where the SQL-esque variables were identified. SleuthQL aims to augment an assessor’s ability to discover SQL injection points by automating some of the request analysis required during a web application assessment. SleuthQL is a Python 3 script to search Burp Suite’s request history for parameters and values that match syntax matching that of database languages, such as SQL. It judges a parameter or value based on whether it matches a regular expression associated with database queries. SleuthQL can scan json, xml, form-data and url-encoded data without issue. If terminal output is preferred, it also prints each path and method that is vulnerable, followed by a list of variable names for an assessor to manually investigate by hand. There are cases where this tool will break down. Namely, if there is nested content-types (such as a base64 encoded parameter within JSON data), it will not be able to identify those parameters. It also does not cover Cookies, as too often something such as CloudFlare will flag a parameter we’re not interested in. What does SleuthQL not do? Currently, there are a few limitations of the tool, such as parsing of nested parameters of different types. For example, there have been instances where JSON POST data is sent to an application with parameter values that are base-64 encoded. That value would not be able to be parsed by SleuthQL and would require an expert’s eye. 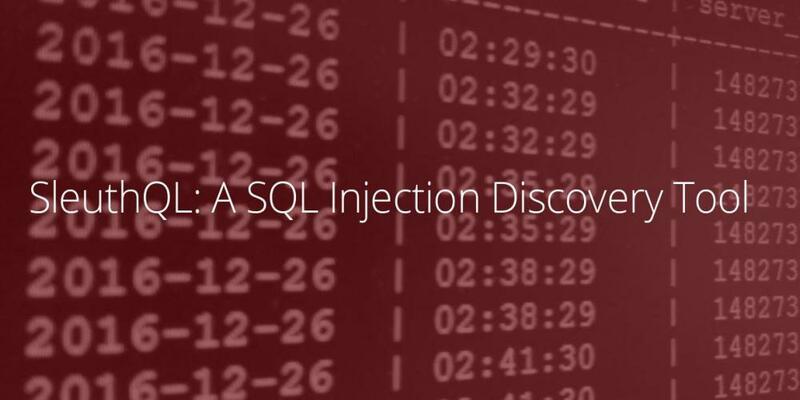 In conclusion, SleuthQL aims to discover potentially vulnerable SQL injection points in web applications by parsing parameter names and values for potentially dangerous values. Using this in tandem with a tool like SQLMap can help augment a regular application audit and ensure a total depth of coverage.